Part of the reason for the sweeping changes found in the 2009 CARD Act had to do with the way many credit card companies did business. High consumer complaints about unannounced APR increases and other issues prompted the U.S. government to move forward with these regulations. There are a few things, however, that weren’t affected when the law was put into place, including the right of credit card companies to decline your charges or purchases for any number of reasons. Of course, that’s not a common practice; after all, there’s a reason credit card companies are profitable and declining their consumers’ charges doesn’t lend to that profit margin. Still, knowing it’s a possibility is enough for any of us to catch our breath every time we swipe our Visa or Mastercard. Many thought one of the big changes associated with the new laws would include an inability for credit card companies to reduce credit lines, but that’s not so. 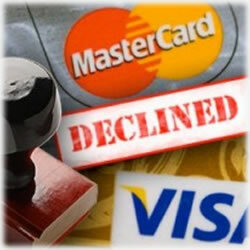 This, along with a few more of the more common reasons your card is declined, make up this week’s post. You might think you have a few thousand dollars available on your credit card, but your card company could have taken a look at a recent credit report or saw where your income had decreased from what it was when you opened your account. As a result, your card company could suddenly reduce your available credit. Worse, it could be that the reduction suddenly puts you over your new limit, which could mean you’re now facing a late payment. A phone call to your credit card company might result in a courtesy removal of the late fee provided you pay at least enough to get you out of the red zone. Fair warning, though: your card company is under no obligation to do so. Many of us, believing we’re doing great things for our credit scores, will not use a credit card often. As a result, expiration dates come and go or else, your card company could put your account in a dormant state. All the while you’ve no idea it’s even happened until you reach in the back of your wallet, dust it off and attempt to use it. A phone call to your card company fixes this, too, though if it’s expired, you’ll have to wait for the new one to arrive. Ever had to prove yourself to your card company? Over the phone? It can be a bit tricky, though if you’ve effectively set up all the bells and whistles with security questions, any hold placed on your account should be easily remedied. Of course, you never get that opportunity until your card’s been denied and you feel more like crawling under the restaurant’s table. That said, it happens often enough that most restaurants know how common this problem is. Usually, though, your credit card company will attempt to contact you before halting all activity. If you’re like many of us, you check your voice mail once in a blue moon, which can be problematic in situations like these. Ah, those pesky due dates. Rack up too many and your credit card company may abandon you with a charge for a major shopping spree and no way to cover it. No phone call can fix that one, but you can easily avoid it by ensuring your payments hit the card company on time. One quick note: you’re more likely to see a pull of your credit privileges if you’ve made late payments too close together. Your card company may think you’re having financial difficulties and do you the favor of a bit of credit tough love. Some of these glitches can result in lower credit scores, so you want to be sure to do a credit check-up on a fairly regular basis. Have a credit card you’ve never used or no longer use? Take it out of your wallet so that the potential doesn’t exist for a denial because of a red flag it can cause with a sudden use. Of course, paying on time is the best way you can avoid all of these “ut oh” moments. And paying your balances in full each month only works to your benefit with big savings on interest charges.